We are proud to be part of the Children’s University network within Sefton. Sefton Children’s University rewards children with credits for all of the extra-curricular learning that they get involved in. (1 hour of learning = 1 credit). This can be in the form of sports clubs, reading, writing, maths, science, art/DT, photography, chess…the list is endless! 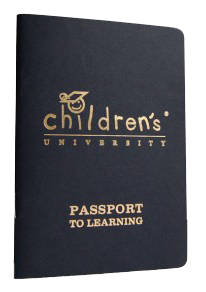 However, if the children purchase a Children’s University passport (pictured), they can gain additional credits from visiting Learning Destinations across the North West and further afield. For example, if you visit the museums in Liverpool and show your passport, they will stamp and sign to say you’ve attended, helping you towards your graduation! Every single club that runs within school is Children’s University accredited. That means for every hour of activity the children do in clubs, they earn a credit towards their graduation in Year 2 or Year 6. In order to graduate in Y2, children need to have collected 30 credits or more. In Y6, the children need to have collected 100 credits or more to graduate. What is Graduation Day like? 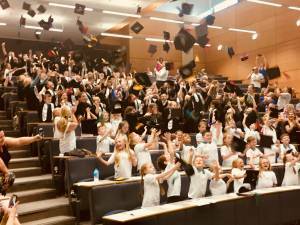 Graduations are held at Edge Hill University in Ormskirk and the ceremonies are wonderful for the children to participate in. Children in Y2 are issued with a Sefton CU t-shirt and collect their certificates from a VIP/guest speaker. KS2 children are issued with a mortar board and gown and issued with their certificates. Official photographers cover the events and they are always a positive celebration of all the additional hours of learning that children have achieved with their time. CU Graduation day – caps in the air! Visit www.childrensuniversity.co.uk for more information about the work of Children’s University. If you want to check if a place of interest is a learning destination, feel free to check the website and search the interactive map or call a member of the Sefton CU team on: 0151 330 5760. You can also follow the Sefton Children’s University twitter account, @SeftonCU and if you share a photo of your child out and about at a learning destination, you will receive a special Sefton CU pin badge!